A joint research project at several universities found that the "persistent presence" of smartphones comes at a "cognitive cost." 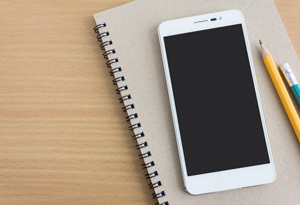 Researchers in the schools of management at the University of Texas at Austin and the University of California, San Diego as well as the Department of Social and Decision Sciences at Carnegie Mellon ran two experiments to attempt to measure how well people finish tasks when their smartphones are nearby — even if the phones aren't in use. For one experiment, 548 study participants were asked to sit at a computer and take a variety of tests that required concentration. The tests were geared to measure their "available cognitive capacity" — the ability for them to hold onto and process data at any given time. Before the testing began, they were randomly assigned to one of three groups. One group was told to leave all their belongings in the lobby before entering the testing room. Another group was told to leave most of their belongings in the lobby, but to take their phones into the testing room "for use in a later study"; once inside, they were instructed to place their phones face down in a specified location on their desks. A third group was informed that they could keep their belongings with them in the testing room and keep their phones "wherever they 'naturally' would"; most (52 percent) put them in their pockets and the rest kept them in their bags. Everybody in all three groups was instructed to turn off the ring as well as the vibrate to prevent the phones from drawing attention. Afterward, participants were asked to assess how much their phones affected their performance on the tasks. Almost all — 80 percent — believed that the location of their phones didn't affect their performance at all. Yet across the board, research subjects whose phones were in the other room did far better than those who had their phones on the desk in front of them; they also "slightly outperformed" those who had their phones with them but placed in a pocket or a bag. And, as the research report explained, the gap between perceived influence and actual performance suggested that people couldn't anticipate or acknowledge the consequences of having their phones with them. The second experiment followed the same basic design of the first one, but participants were also asked to self-report their smartphone dependence based on such factors as how difficult it would be for them to get through a normal day without their phones or how anxious they'd feel if they forgot their phones. Those who felt they were most dependent on their smartphones did worse on the tests, but only when they placed their smartphones on the desk or in their pockets or bags. It didn't matter whether the phone was facedown or face up, turned on or turned off. According to the researchers, just having the phone within sight or reach reduced their ability to focus and do the tasks asked of them because some part of their brain was "actively working to not pick up or use the phone," as an article about the experiment explained. "Ironically," the researchers noted, "the more consumers depend on their smartphones, the more they seem to suffer from their presence — or, more optimistically, the more they may stand to benefit from their absence." The researchers specifically addressed smartphone usage in the education. Their advice: Think twice. "As educational institutions increasingly embrace 'connected classrooms'," the report stated, "the presence of students' mobile devices in educational environments may undermine both learning and test performance — particularly when these devices are present but not in use." If we are to regain our full thinking power, there's just one simple solution, the results observed: separation. Adding "defined and protected periods of separation" to our lives, the researchers suggested, "may allow consumers to perform better not just by reducing interruptions but also by increasing available cognitive capacity." The research results are openly available on the website for the Journal of the Association for Consumer Research, published by the University of Chicago Press.